Pai Skincare: Pai is one of those brands that works consistently and follows its own path, working alongside the feedback the team gets from its customers. While their Camelia & Rose Gentle Hydrating Cleanser isn’t new ( Pai recently changed its packaging, making it bigger, most cost-effective for the customers ( with cleansers you have a choice of 100 or 200 mls ) , as well as more visually distinct glass bottles for its moisturisers ) it is a great cleanser that you can use on your face, as well as around your eyes, thus making it a great skin care two-in-one product for travel as well. This winter has been cold and it always distresses any skin type, particularly the sensitive one, so Pai’s gentle cleanser will melt make-up and get rid of the impurities with the help of the exfoliating muslin cloth that is inclosed with the cleanser-just don’t forget to wash it daily, so bacteria doesn’t accumulate and cause breakouts. Another benefit of this cleanser is that it doesn’t contain alcohol and the rose extract will help your skin to retain moisture and get your skin ready and balanced for the summer heat. *Organically produced (80% of product). Sisley Botanical D-Tox was launched last year and I started using this month-long treatment again, as soon as March appeared on my calendar list. It was created by Hubert and Isabelle d’Ornano in order to provide their loyal customers with a detoxing night treatment, as our skin and our body, as well as the mind, relax and rejuvenate the fastest during night time, when we sleep. The cream contains detoxifying plant extracts of rice & ginko biloba and sunflower, sage, hop, lavender and rosemary essential oils that you will find particularly useful at times when you are under stress or feeling quite tired. It enhances nightly cellular regeneration and focuses on the role of proteasome, found in the centre of our cells ( it plays an important role in eliminating damaged proteins and helping to produce new ones ). Sisley had another night treatment that I first bought in Switzerland several years ago but even though it was effective I didn’t particularly like its smell, so this product, to me, is an improved version of it, with a much creamier consistency ( it is a non-oily emulsion ), quicker absorption and very pleasant smell of herbs and flowers, which energises your skin and your senses. By the time you finish the bottle ( you use it nightly, after cleansing your face thoroughly -on its own or under your usual night cream – my advice would be to see if the combination works well, as not all creams, especially if they are from different brand, work in harmony. Personally, I prefer to use this Sisley product on its own. ) you will hopefully notice, like I did, an improvement in your skin’s radiance levels, more even skin tone and an overall more supple look of your skin. 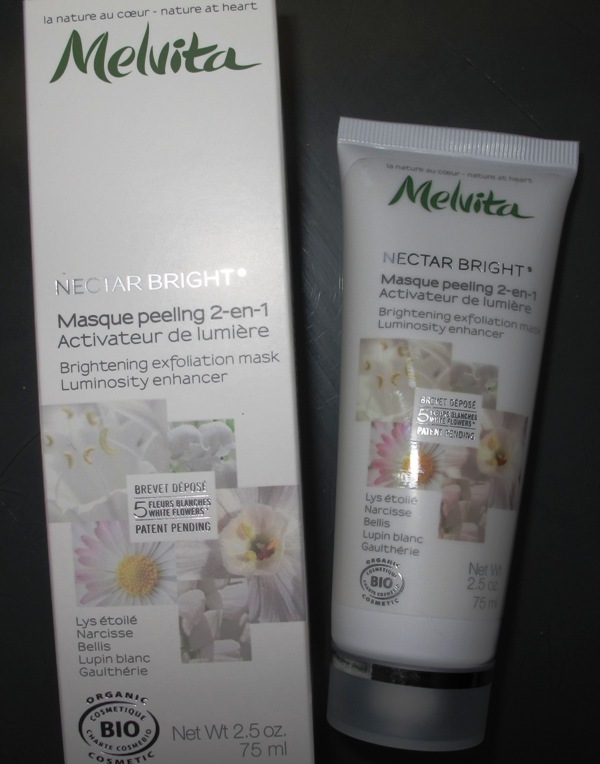 Melvita: this French, EcoCert brand is becoming more prominent in the UK and their latest launch from ‘Nectar Bright’ line, a Brightening Exfoliating Mask certainly delivers what it promises. The mask itself is creamy, like a cleanser but has exfoliating silica microbeads. After cleansing your face, pat your face dry and apply the mask generously, leaving it on for five to ten minutes. While the mask is working take the time to light the candle and meditate in peace, before going back to the bathroom and massaging the mask with your fingertips, paying particular attention to your forehead and nasal folds. Wash the mask off with warm, but not hot water and examine your skin in the mirror, hopefully seeing a clearer, brighter skin ( thanks to five plants with white flowers, including narcissus and daisy ). Apply your serum, night cream or face oil and go to bed feeling both serene and beautiful. Ingredients: AQUA/WATER – CAPRYLIC/CAPRIC TRIGLYCERIDE – CITRUS LIMON (LEMON) FRUIT WATER* – HELIANTHUS ANNUUS (SUNFLOWER) SEED OIL – GLYCERIN – ARACHIDYL ALCOHOL – ALCOHOL*** – BEHENYL ALCOHOL – SILICA – CERA ALBA/BEESWAX* – BAMBUSA ARUNDINACEA STEM EXTRACT – COPERNICIA CERIFERA (CARNAUBA) WAX – HYDROLYZED WINTERGREEN EXTRACT – BELLIS PERENNIS (DAISY) FLOWER EXTRACT* – PANCRATIUM MARITIMUM EXTRACT – NARCISSUS TAZETTA BULB EXTRACT* – TOCOPHEROL – GLYCERYL STEARATE SE – ARACHIDYL GLUCOSIDE – SODIUM STEAROYL GLUTAMATE – LEVULINIC ACID – XANTHAN GUM – GLYCERYL CAPRYLATE – SODIUM LEVULINATE – BISABOLOL* – GALACTARIC ACID – HYDROLYZED LUPINE PROTEIN*** – ALUMINA – PHENETHYL ALCOHOL – PARFUM/FRAGRANCE – SODIUM BENZOATE – CI 77891/TITANIUM DIOXIDE – LINALOOL** – CITRONELLOL**. Kjaer Weis: With the right skin care routine and products for your particular skin type and age, your face will become a perfect canvas for make-up, so can I tempt you to try an organic cream foundation that will work as well ( well, actually better as it’s not going to cause your skin any harm ) as your regular well-known brand? Created by a Danish make-up artist Kirsten Kjaer Weis, this cream foundation comes in a heavy and chic make-up compact, glides seamlessly, hides imperfections and actually enhances, rather than hides your skin, while making you look photo ready. It contains nourishing almond and jojoba seed oils, as well as my favourite coconut oil. It is very light and you can build it up if you want a little bit more coverage. The foundation comes in five shades ( to find your best match, if shopping online, check Kjaer Weiss website for perfectly detailed descriptions of each shade, skin colour and undertones ) and its most popular, lightest shade, called ‘like porcelain’, keeps on selling out. I find that I don’t need a primer with this foundation ( it gives you a matt finish, just make sure that your skin is well-moisturised prior to application ) and it works perfectly in tune with a creamy blusher and bronzer that can be layered seamlessly, making you look like a poster woman of natural beauty. Kjaer Weis Cream compact foundation compact, £49; refill £29. Pai’s cleanser is creamy but not to runny, so makes a lovely evening treat for the skin and helps create good massage traction. Very happy that you enjoyed reading the post Sarita!